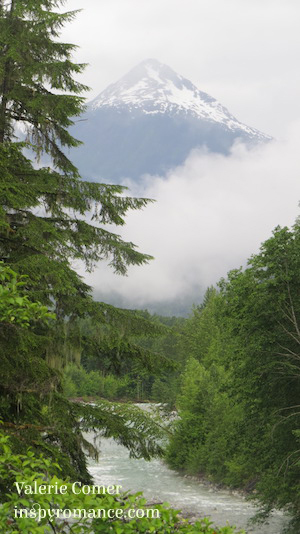 Today’s photos were taken in the Bella Coola Valley. After many miles of plateau country, BC’s Highway 20 dives off The Hill, going from a 5,000 foot elevation to sea level in 27 miles of gravel roads with multiple tight switchbacks (around one of which we found the bear I showed you last week). At the bottom, it opens up into a flattish valley surrounded by the Coast Mountains, first-and-second-growth forests, sparkling creeks, and terrific farmland. This area hasn’t been affected by the forest fires I’ve been mentioning the past few weeks, other than road closures for driving out. They do have sea and air access. Meanwhile, above them on the plateau country, some fires of many square miles are still burning out of control. The populations of entire towns and cities have been evacuated for over a week while emergency personnel continue the fight to save their homes. We do have several comparatively small fires in our region, none threatening communities or affecting air quality at this time. Please do keep praying! Janet Ferguson’s winner of a book by Francine Rivers is Laura! Heather Gray’s winner is Tracie Cooper! Jill Weatherholt’s winner of a book by JoAnn Durgin is Tracey Hagwood! Lindi Peterson’s winner is Colleen! Valerie Comer’s two winners are lindamoffitt02 and Julianne Archer! Merrillee Whren’s winner is Angie Carroll! If you’re interested in over 40 Christian contemporary romances with Christmas themes, eleven of them from Inspy Romance authors (plus five from former Inspy Romance authors! ), each for 99 cents, click here. Only through July 25. On Monday, Jackie Castle welcomed us to Sweet Grove: a small town with a big heart. 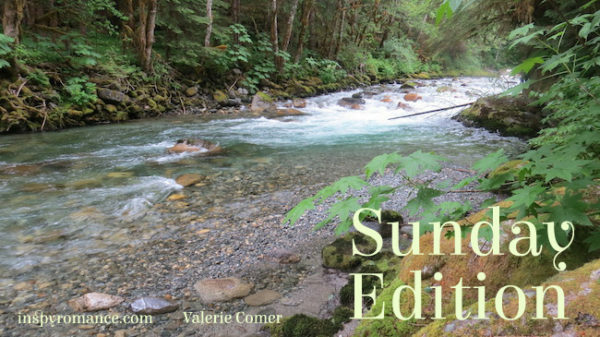 On Tuesday, Valerie Comer presented an Interview with Myles Sheridan… and giveaway. On Thursday, Merrillee Whren offered a Moon Day Giveaway. On Friday, Staci Stallings explored her thoughts on The Price of Silence. On Saturday, Jolene Navarro shared her Simple Joys in a Complex World… and giveaway. Hi Valerie, thanks for sharing more photos. 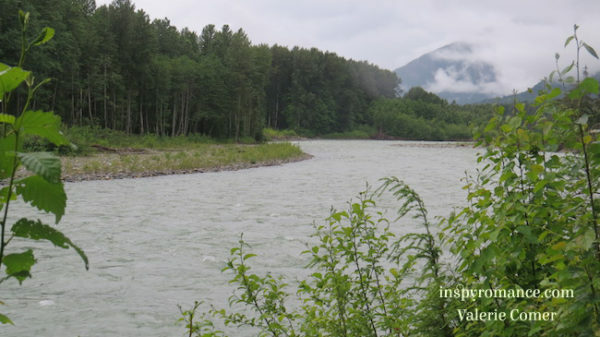 This looks like a place I definitely need to visit- the Bella Coola River looks fun for paddling! It probably would be! It’s very popular for salmon fishing, but we weren’t there at the right time. 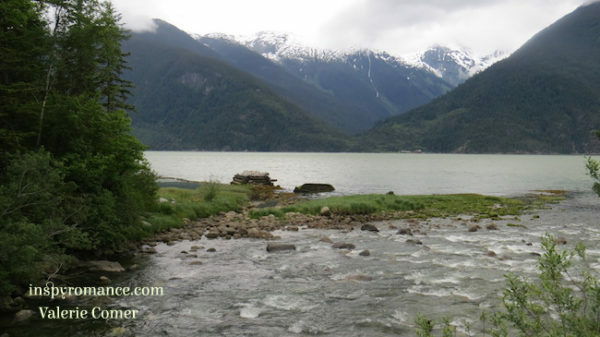 They also do float tours down the river to watch for bears – but again, best during the salmon run. Inspiring pictures Valerie! Thanks for the update on the fires! Congrats to the winners! The creek picture is my favorite, reminds me of Hickory Creek in SW Michigan, where my sons loved to play! Best wishes! I just loved the clear blue-green color of glacial melt in those creeks! If you’ve looked at my vacation photos on Facebook, Thorsen Creek is the one we hiked along to view the petroglyphs. It was cool – weather near freezing overnight! Very north coastal. Happy to share the beauty! Lovely pictures! Thank you for sharing. The tight switch backs would be a challenge. Lord bless the people affected by fire. Let’s put it this way: If I were behind the wheel, I wouldn’t have driven that hill! But either way, I don’t drive the truck when we’re towing the trailer, anyway! I’m glad we went, though. My thanks to JoAnn Durgin for the giveaway win of her book, The Valentine Verse, I can’t wait to jump in and read it! Hi Tracey! Congrats on being a winner! BC is a big place with wide ranging temperatures. Here in the southeast, we’re anywhere from 82 to 90F today, where a couple of weeks ago we were in the high 90s… so this is much more pleasant! In the coastal areas, the temperatures don’t fluctuate as much. Beautiful pictures! Love the creek and the path thru the big trees. 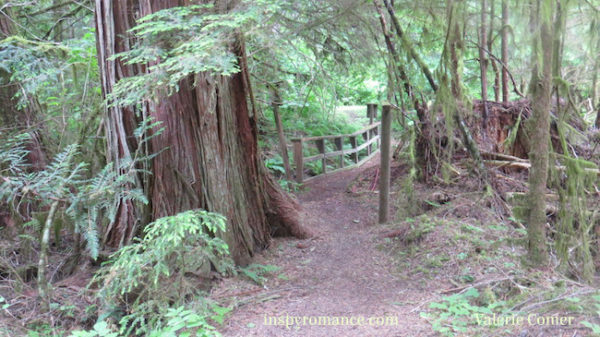 Looking forward to another terrific week on Inspy Romance! Thanks! Always a pleasure to have you here.